Product prices and availability are accurate as of 2019-04-21 10:34:50 EDT and are subject to change. Any price and availability information displayed on http://www.amazon.com/ at the time of purchase will apply to the purchase of this product. 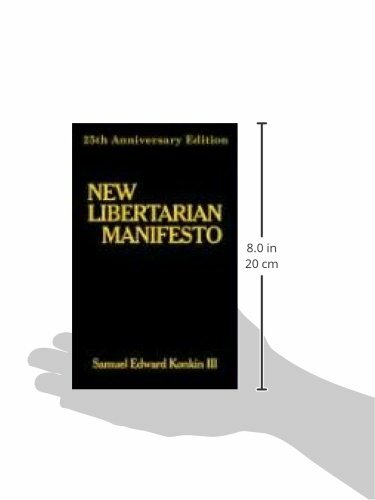 New Libertarian Manifesto -- The 25th Anniversary Edition, by Samuel Edward Konkin III (1947-2004), brings the groundbreaking work back into print. First published in October, 1980, the Manifesto is the most concise treatise on Counter-Economics and Agorism available to the public. Five chapters encompass Konkin's unique view of libertarianism: I. Statism: Our Condition; II. Agorism: Our Goal; III. Counter-Economics: Our Means; IV. Revolution: Our Strategy; and V. Action: Our Tactics. The 25th Anniversary Edition is the fourth printing of the book, which has been an underground anarchist classic. Also included in this edition are critiques of New Libertarian Manifesto by Murray N. Rothbard, Ph.D., Robert LeFevre, and Erwin S. Strauss, and replies by Samuel Edward Konkin III, which were published in Strategy of the New Libertarian Alliance in 1981 and long out of print until now. ISBN13: 9780977764921 Condition: New Notes: BRAND NEW FROM PUBLISHER! 100% Satisfaction Guarantee. Tracking provided on most orders. Buy with Confidence! Millions of books sold!